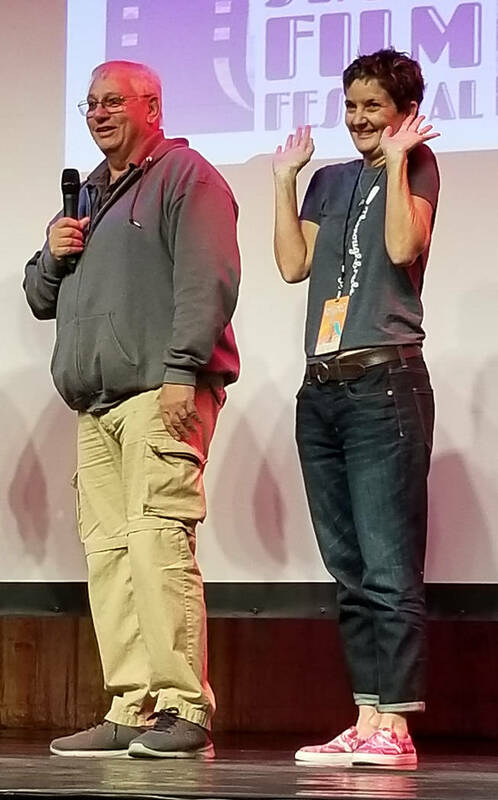 Ron and Wendy Krajewski of Henderson greet the audience after the screening of the documentary “My Paintbrush Bites” on Friday at the 15th annual Dam Short Film Festival at Boulder Theatre. The film documented the life of their late horse, Metro, who learned how to paint. 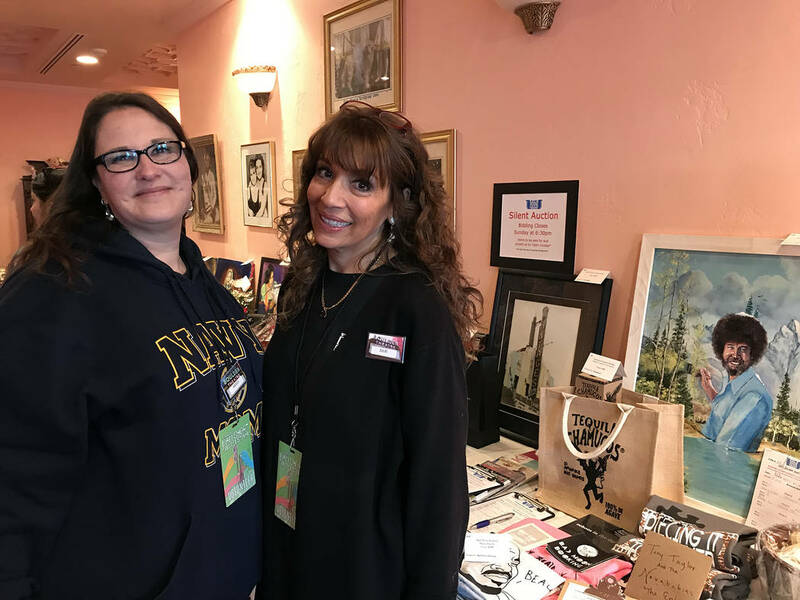 (Hali Bernstein Saylor/Boulder City Review) Angela Condon, left, and Julie Wignall, who have been volunteering with the Dam Short Film Festival for two and three years, respectively, helped with the silent auction at the theater Saturday, Feb. 9, 2019. 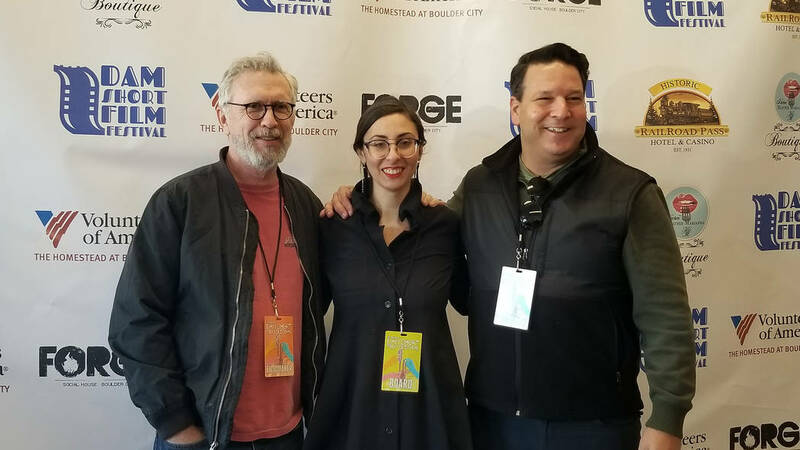 Celia Shortt Goodyear/Boulder City Review Actor Steve Coulter, left, arrives at the 15th annual Dam Short Film Festival on Friday, Feb. 8, with the festival's Director of Development Tsvetelina Stefanova and friend and producer David Silverman. Silverman's film, "The Producer," starring Coulter, was screened at the festival held at the Boulder Theatre. Celia Shortt Goodyear/Boulder City Review Ron and Wendy Krajewski of Henderson greet the audience after the screening of the documentary "My Paintbrush Bites" on Friday, Feb. 8, at the 15th annual Dam Short Film Festival at Boulder Theatre. The film documented the life of their late horse, Metro, who learned how to paint in his later years. 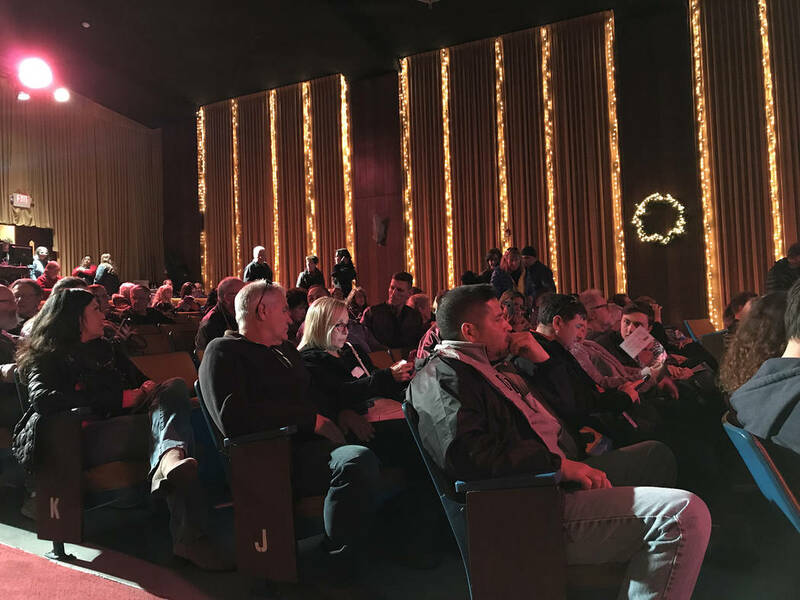 (Hali Bernstein Saylor/Boulder City Review) Film aficionados pack the Boulder Theatre for the Dam Short Film Festival on Saturday, Feb. 9, 2019. 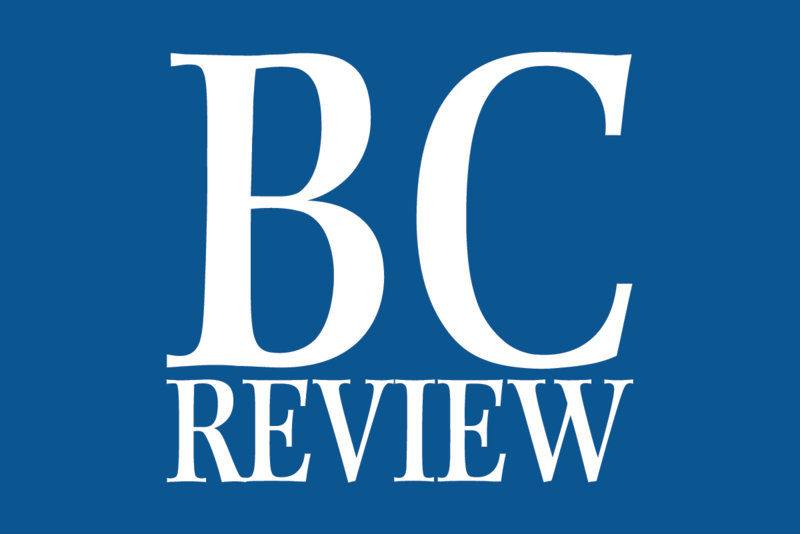 Celia Shortt Goodyear/Boulder City Review Writer and director Mick Dow explains how a stunt was done in his short film, "Hope in a Box." The film was screened at the 15th annual Dam Short Film Festival on Friday, Feb. 8, at the Boulder Theatre. Actor Steve Coulter, left, arrives at the 15th annual Dam Short Film Festival on Friday, Feb. 8, with festival Director of Development Tsvetelina Stefanova and friend and producer David Silverman. Silverman’s film, “The Producer,” starring Coulter, was screened at the festival held at the Boulder Theatre. 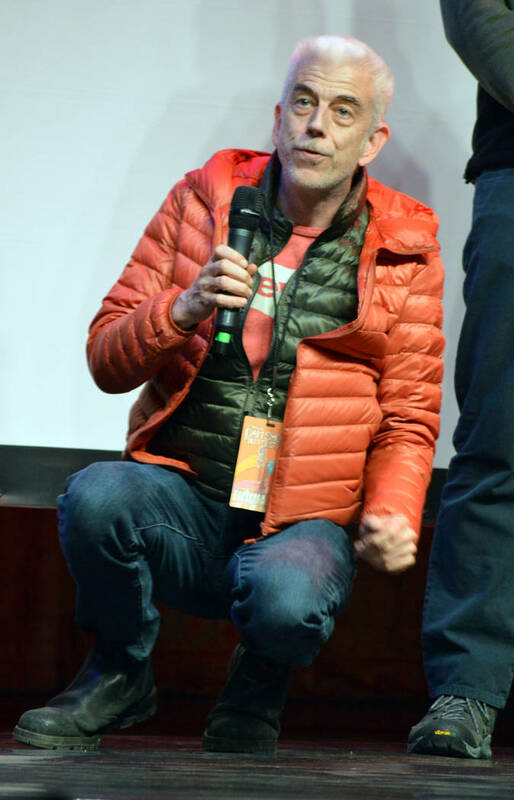 Writer and director Mick Dow explains how a stunt was done in his short film, “Hope in a Box.” The film was screened at the 15th annual Dam Short Film Festival on Friday, Feb. 8, at the Boulder Theatre. Angela Condon, left, and Julie Wignall, who have been volunteering with the Dam Short Film Festival for two and three years, respectively, helped with the silent auction at the theater Saturday. Film aficionados pack the Boulder Theatre for the Dam Short Film Festival on Saturday.